Home > About US - XOXO! in the Victorian House at Eric Town Square. 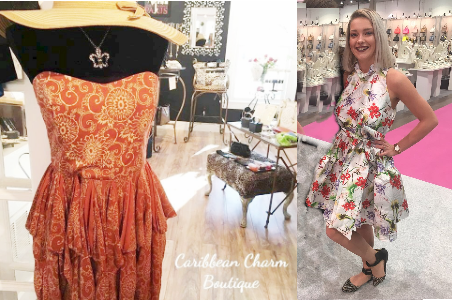 Caribbean Charm Boutique captured the essence of the old Caribbean. Founded in 2006 is our lifestyle website dedicated to inspiring you as a shopper to shine brightly in every purchase you make. 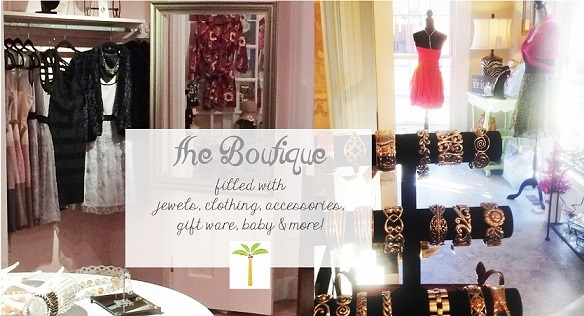 Our lovely on-line boutique carries women’s classic resort wear and colorful tropical clothing, as well as jewelry, handbags, hats, baby and other accessories for the sophisticated Caribbean lifestyle. 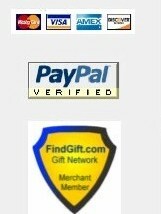 We also offer a wonderful assortment of unusual gifts and creative gifts for any occasion. We monogram and engrave your purchases to create a personalized gift. Our passion is to help you find and leave with a favorite treasure. And, inspire you to come back. Our motto is "Relax, Enjoy and Shop! " Leaning Tree cards, plus many other products that are sure to delight! Our Beautiful Leopard Maxi, such a great match to Brighton's Atlantis choker and Dahlia Shopper. 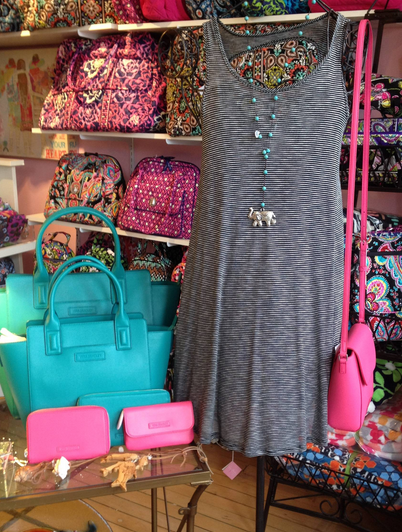 Our Beach Romper is a great match to Vera Bradley's new Northbrook Collection. We offer on site engraving and monogramming. 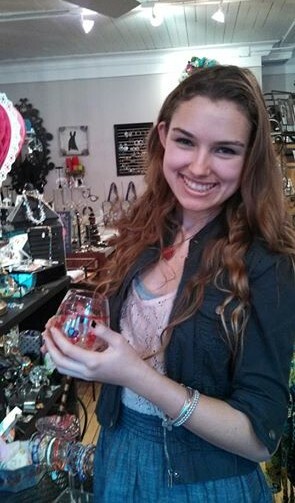 Julia learned to be a fabulous engraver, wearing an engraved heart necklace, and holding an engraved heart wine glass. 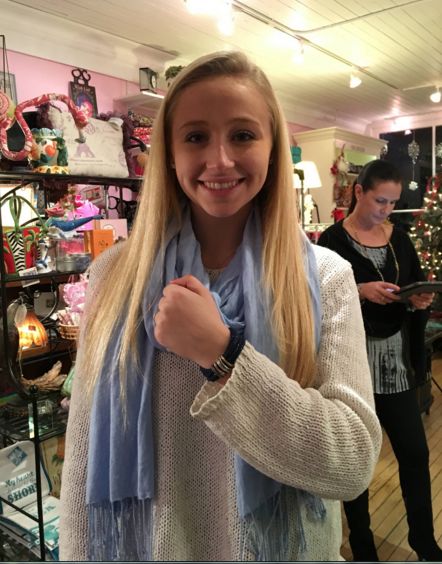 Don't you Love the Brighton Bracelet Catherine is wearing! 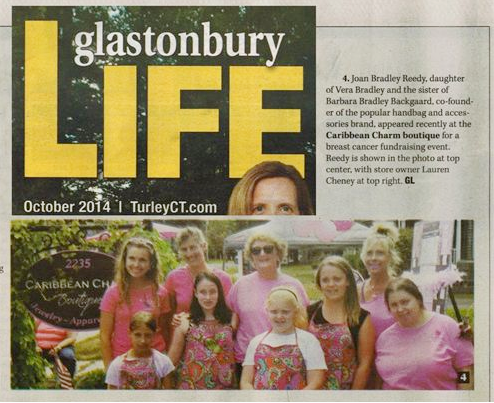 In September 2014 Caribbean Charm hosted a Breast Cancer Fundraiser event in Partnership with the Vera Bradley Foundation for Breast Cancer. Caribbean Charm was honored to have Joan Bradley Reedy, the daughter of Vera Bradley and sister of Barbara Bradley Backgaard, co-founder of the popular handbag and accessories brand, join in the event! 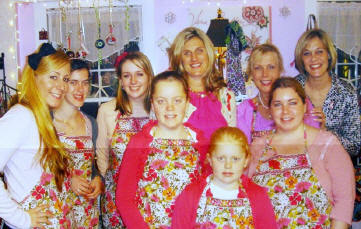 In February 2012 Caribbean Charm hosted a Breast Cancer Fundraiser event in Partnership with the Vera Bradley Foundation for Breast Cancer. A Thank you to all the helpers that made our event a success. Pictured left to right - Stefanie, Carly, Alicia, Heidi, Kelly, Kelly,Lauren, Kelly and Heidi Floyd - the Vera Bradley Foundation Ambassador. the reggae rhythm we were captivated by the charm. And, decided to bring it home. Our doors are open to all - any questions send an e-mail to contact us. We traveled to Tortola to escape, after a long treatment battling the life threatening scary "C". We wished upon a falling star and thank God everyday that we are here to live, to laugh, to love...and most of all to have fun! !